The definition of AI is continually evolving, and understanding of its capabilities and applications varies widely across the healthcare industry. While AI is a relatively new area in the healthcare space and its adoption is in the nascent stage, digitalization of healthcare is accelerating enterprises’ interest in AI. AI presents unique opportunities for healthcare enterprises, allowing them to improve customer experience, achieve operational efficiency, enhance employee productivity, cut costs, accelerate speed-to-market, and develop more personalized products. With CEOs and CIOs acknowledging the transformative power of AI, enterprises are rapidly building appropriate AI strategies. To help healthcare gain better visibility into the impact of AI, Everest Group has analyzed the market from the vantage point of 27 leading healthcare enterprises. 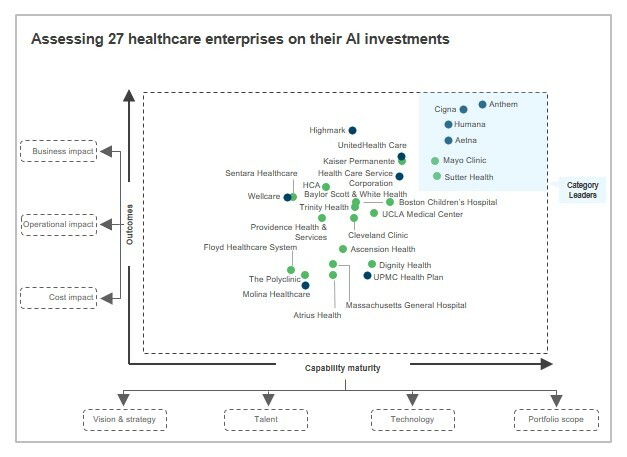 This report demystifies AI adoption across the healthcare ecosystem and assess leading enterprises on AI investments. We have unpacked the distinctive attributes of the leaders that are far ahead of the other industry participants in terms of AI capability maturity, especially in areas such as vision and strategy, talent, and next-generation technology adoption. In this report, we have identified the leaders' best practices, illustrated the impact generated, and helped enterprises understand the AI innovation ecosystem. We have also proposed a roadmap for market stakeholders.This report also delves into the future of AI adoption in healthcare.